To help you work out how much you could receive in terms of Domestic RHI payments we have created a RHI Calculator Tool. By inputting some simple information about your property you can get an indication of how much your RHI payments could be. The tool will also estimate your likely energy cost savings. The cost savings and RHI payments together could repay the initial costs of installing your renewable heating system. The new RHI scheme payments are based on your property’s estimated annual heat use. The scheme is administered by Ofgem and they use information from your EPC (Energy Performance Certificate). 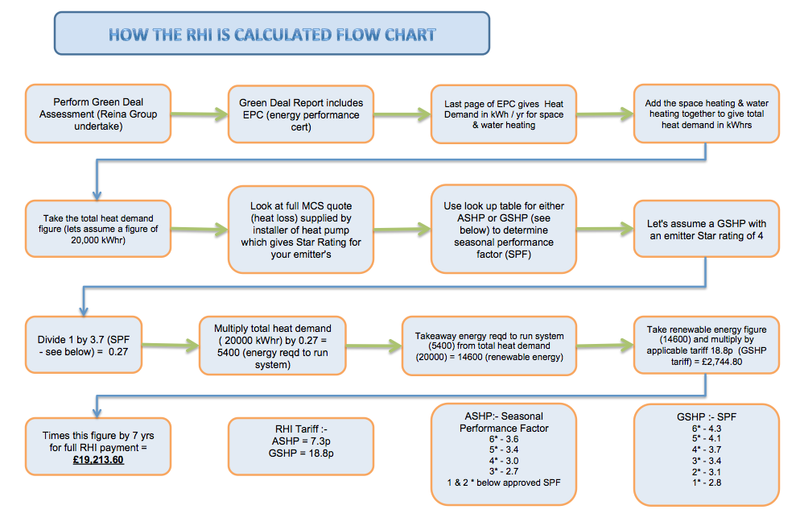 If you are installing a heat pump system, the payments also take into consideration the efficiency of the system itself, seen as the SPF (Seasonal Performance Factor) in the flow chart above. This is because heat pumps use some non-renewable energy to run. The RHI payments come from the public purse, so it’s important that you only receive money for the renewable energy that you use. In the flow chart you will see a worked example. If a ground source heat pump with a 4 star emitter rating is installed in a property with a total heat demand of 20,000kWh, the yearly tariff paid would be £2,744.80. Over seven years, this would total £19,213.60. If you are interested in seeing how your renewable heating system is performing and looking at the data, you can apply to volunteer for the optional Metering and Monitoring Service Package. This is available on a first come first served basis. Volunteers will receive an additional £230 per year if you have a heat pump, or an extra £200 per year if you have a biomass boiler. The annual payment is paid for the duration of the scheme (maximum of seven years).